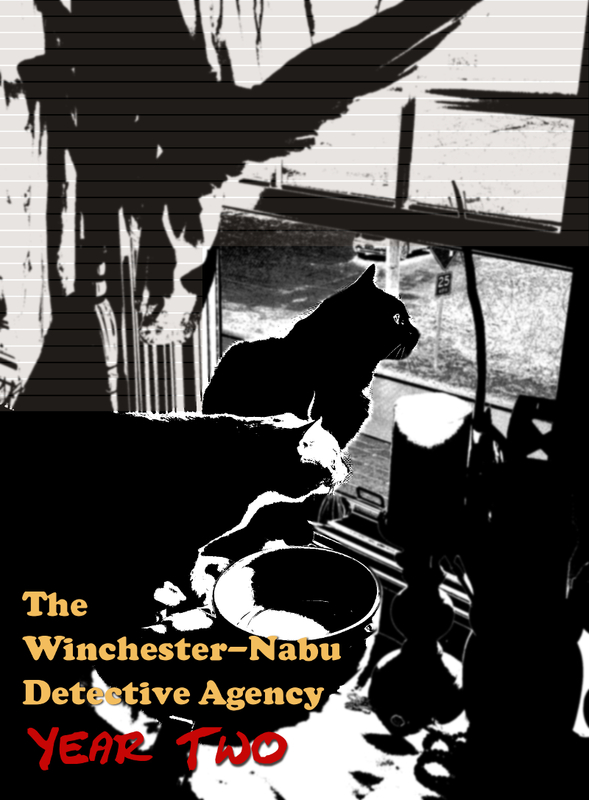 AMBER LOVE 07-JAN-2019 Catch up on Year One and previous Year Two cases at the Winchester-Nabu Detective Agency. 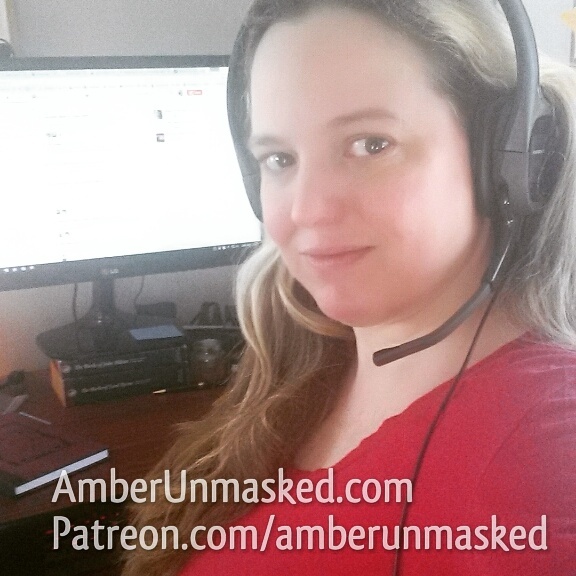 This work is supported by the generous backers who adore my cat stories at Patreon.com/amberunmasked and they also get first access to what’s happening with my books and podcast. For a one-time tip, you can go to the new PayPal.me. 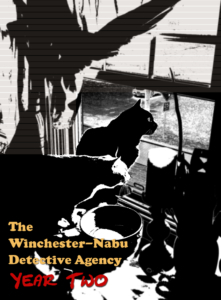 The Grumpy Old Man sought help from the experts at the Winchester-Nabu Detective Agency to get rid of some rodent squatters in the mobile command unit. Unfortunately, Gus did not bring anyone into custody, but his presence may have been enough to make them move on. This case file goes back to November and to be perfectly, it’s not much of a case. It’s another report on Detective Inspector Burton Guster Nabu’s brutality. Today’s victim: Kyra Sedgewren. 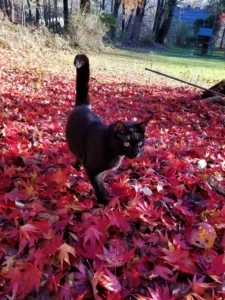 The edge of the forest still had bright leaves from the Japanese maple trees. They created a lush red carpet — only this wasn’t going to be for an awards show. It was the perfect scarlet shade to hide any traces of blood without luminol. Gus was in his glory. 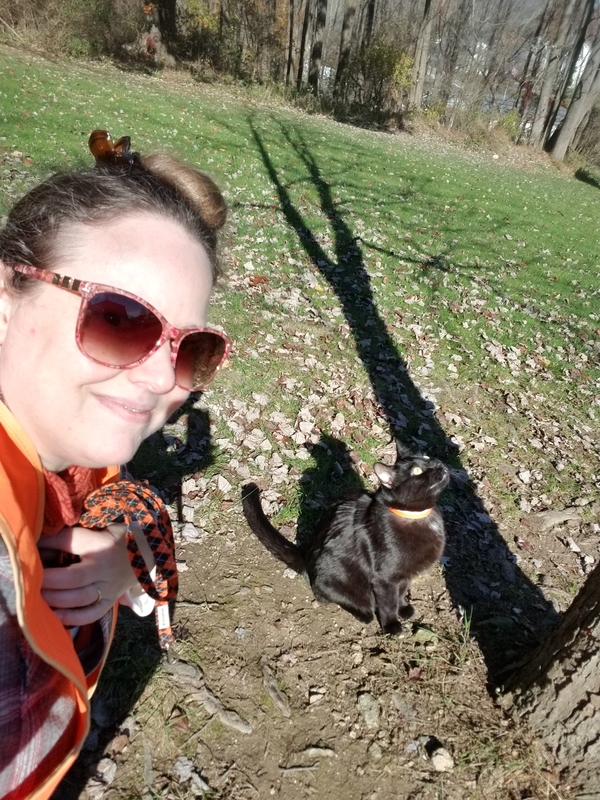 He loved the fresh air and the chance to stakeout the new bird feeder at the border of the back forty. 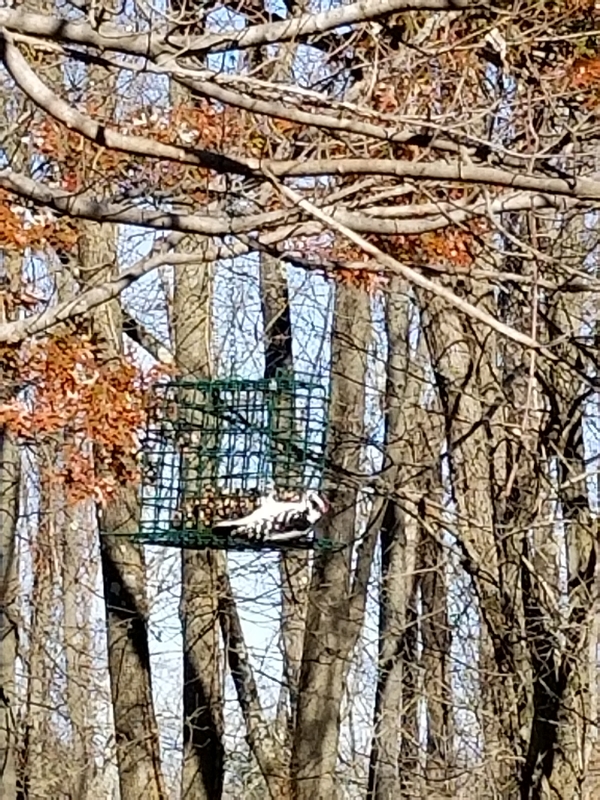 Woodpecker hanging on the bird feeder. This new bird feeder hangs from the Walden Woods maple tree. It has to be on the lowest branch so I can reach it. I’m not sure how much the squirrels get of it, but it’s probably a lot. A whole brick of seeds can disappear in two days. 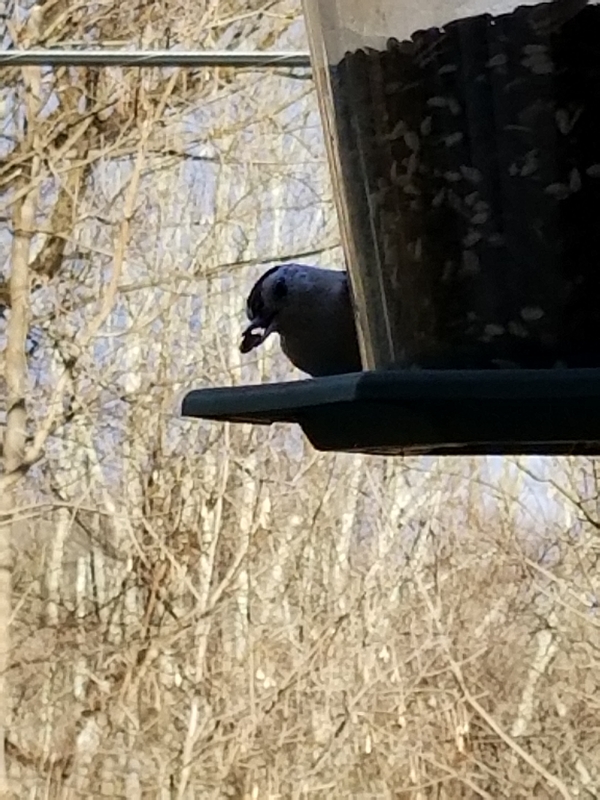 Sure there are a number of birds, but these are the tiny birds: nuthatches, chickadees, tufted titmouses (titmice? ), small red-bellied woodpeckers, and the occasional medium sized bird like a cardinal or a larger woodpecker. Gus and I have witnessed with our own eyes, the wily squirrel who goes out on the branch and somehow sits on the feeder for snacking. Although, one day, this clever bugger opened the latch and took the seed brick out. We found half of it on the ground. Oliver told Gus that we should investigate which squirrel was stealing from the birds. 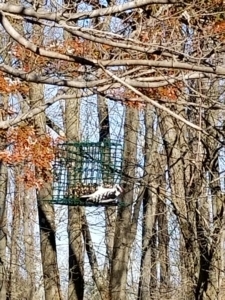 If we could find out where it centrally hung out or nested, I could put peanuts there and keep the squirrel satisfied so it wouldn’t feel the need to pilfer from the birds. 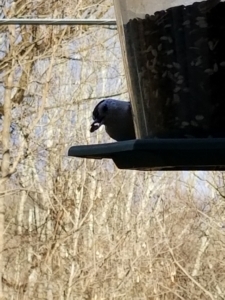 The humans in the north wing of the residence tend to the bird feeder in the front yard and they have the same problem. Over there it’s impressive because there’s no branch for the squirrels to climb out. Somehow they go from the porch railing to the long metal pole and climb that to the end to reach the bird feeder. Then they fly right down. It’s pretty wild. I think it’s a pair of them working together in the front. Sometimes, Gus and I are still walking through Gnome Grove and then the Fairy Garden when he sees activity way in the back. I love watching him sprint all the way there. Two things Gus loves: running and climbing. And so, when a petite sedgewren landed on the tree trunk way too low (no idea what it was thinking, Gus was sitting right there! ), the cat barely had to leap. 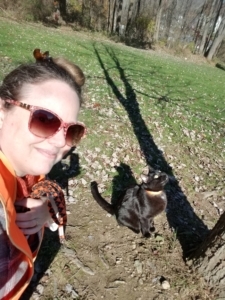 He got all paws on the tree and captured Ms. Kyra Sedgewren in his teeth. 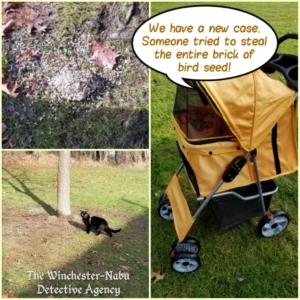 This meant we had no witnesses to question about the thieving squirrel! 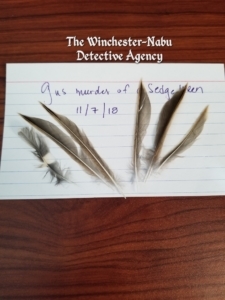 Pour one out for Kyra Sedgewren. The agency needs to obtain more evidence into the identity of the squirrel who is stealing food from the birds at the Walden tree. 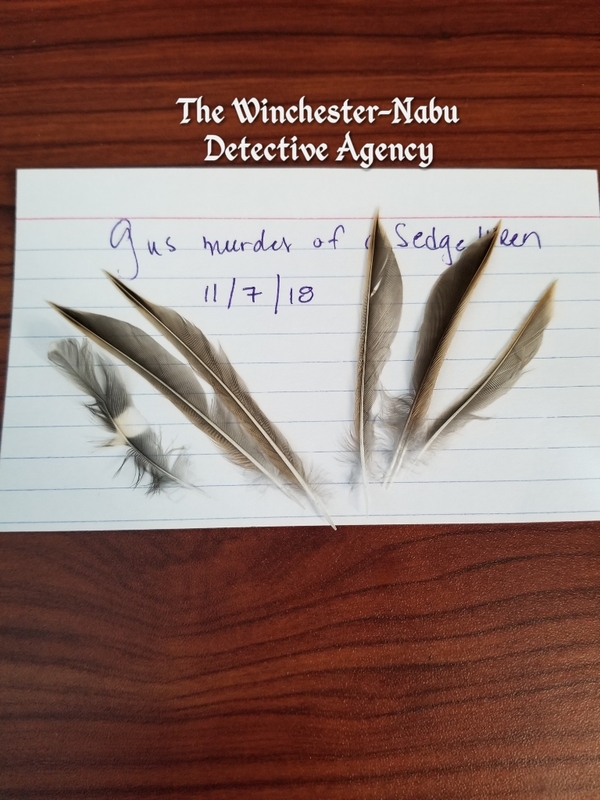 Status for the Murder of Kyra Sedgewren: Accidental Homicide. Closed.